A series of presentations and exhibitions have been held in a hotel adjacent to the headquarters of the International Olympic Committee (IOC). The Beijing team who are promoting the bid for the 2022 Winter Olympics in Lausanne have vowed to host a clean Games, in terms of fair play and air quality. "Sports must be free of doping and clean athletes must be protected," said Liu Peng, head of both the Chinese Olympic Committee and State General Administration of Sport. Liu told the 85 IOC members attending the candidate city briefings that China has a zero tolerance policy against doping, and its WADA-accredited and world-class laboratory and experienced personnel will ensure the full success of the Games in 2022. Beijing and its co-host Zhangjiakou, about 200 km northwest of the Chinese capital, are now competing against Almaty, Kazakhstan, for the right to host the 2022 Winter Games. With a strong economy and the rich legacy of the 2008 Summer Olympics, Beijing has been widely tipped as a favorite. Following Wednesday and Tuesday's briefing, presentation and exhibition, the Beijing team seem to have more confidence that they are on the right track to convince the IOC members. "From tomorrow to the July 31 host city election, we will focus on continuing to listen to the Olympic Family, explaining the strengths of our bid and transformative mutual benefits that awarding the Games to Beijing would bring," Wang Anshun, Beijing Mayor and President of the Beijing 2022 Bid Committee, told Xinhua. However, as shown in Tuesday's press conference, air quality has always been a most frequently asked question to Beijing. Air pollution is believed to be one of the major problems that could hurt Beijing's chance. Beijing started a five-year plan to clean the air in 2013. With a total investment of 130 billion US dollars in five years, Beijing expects to cut the density of PM2.5, or harmful particles that are small enough to enter bloodstreams, by 20 percent in 2017. "We are confident that we can have fresh air in Beijing, not only by significantly improving the air quality, but also by paving a new, healthier and greener path for the city and the surrounding region's development for years to come," Wang said. According to the mayor, coal consumption in Beijing in 2017 will decrease to less than 10 million tonnes from 23 million in 2012, and with all the measures in place and a rising public awareness on environmental protection, experts expect Beijing air to meet international norms by 2020. Beijing has effectively guaranteed high air quality during critical times. During the APEC summit, Beijing's ability to ensure blue skies led to the coining of the phrase - "APEC Blue". Wang Hui, deputy secretary general of Beijing's bid committee, admitted that it is yet to be seen whether Beijing will still need to resort to unconventional measures, such as road space rationing, if the city wins the IOC nod, but winning can help the city tackle air pollution. 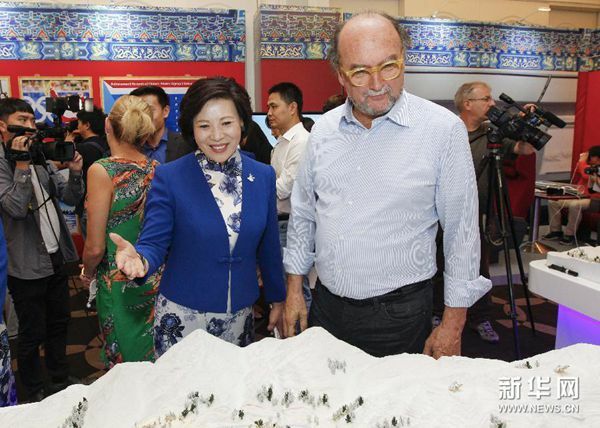 "A successful bid will surely help speed up the cities' pace in easing pollution, and the two-city bid will help the Beijing-Tianjin-Hebei region better coordinate their efforts to fight pollution," she said.